Here is a short diddy on Nutella. I haven’t had it in the house in a while and I made change of that. 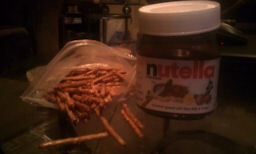 Short of just eating it out of the jar, I will pair it with things. As I write this, I forgot all the fruit you can eat it with! Do not forget about the fruit! 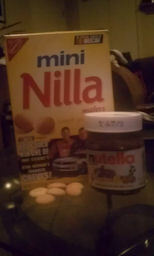 First is Nutella with Mini Nilla Wafers. Let me also state that, with this whole, ‘need to wrangle my space’ thing, I am chunking the resolution down low. For food, and Photo a Day. The nice stuff will stay nice, and the nice and nicer will be at Bespoke, right next door! That will surely let me put it off for… a little while longer! Delicious. This one is a good one to binge out on… Small, sweet and salty. 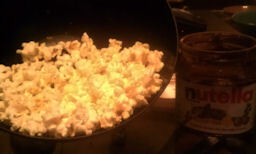 Next is more of a prep treat, as in prepping the popcorn by cooking it. You could call it a recipe! There we have it, friends! Chocolate hazelnut spread on.. just about anything, you’re gonna have a good time. Don’t forget the fruit!! Nutella tastes pretty good on apples too.